my take: Under the category of "expectations are everything"... we picked this book for Book Chicks based on my mother's raving about how great it was. I overheard her discussing it with hubby and talking about how like The Great Gatsby it was ... unfortunately I hadn't read Gatsby for a while and I hadn't read Netherland yet, so I didn't really pay attention, just tucked the information away. 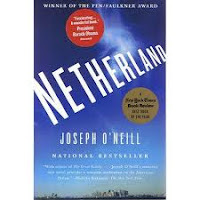 So we read Gatsby and then we read Netherland. I spent the entire novel trying to see any similarity. Like banging my head against a wall. Which made the novel frustrating. (I did, however, learn a lot about cricket.) Reading the reviews on the back of the book, it would seem I missed a lot. And a glance at the front cover ... "echoes of The Great Gatsby." ugh! See new parts of NYC and enjoy them through the eyes and lives of these international characters. my verdict: hmmm. in the right frame of mind, yes.